What it’s about: It’s like the Rock & Roll Hall Of Fame for everything but rock ’n’ roll. Mostly in the sense that someone built a big monument that no one should ascribe any importance or credibility to whatsoever. The Stanford White-designed hall sits on the campus of Bronx Community College, and consists of a sculpture garden with busts of 98 Americans deemed worthy of inclusion. Biggest controversy: The original Hall Of Fame class included traitor-to-his-country Robert E. Lee alongside the likes of Lincoln, Grant, and abolitionist Henry Ward Beecher. In 1955, the United Daughters Of The Confederacy nominated Confederate general Stonewall Jackson (Jefferson Davis was nominated and rejected). In 2017, New York Gov. Andrew Cuomo ordered Lee and Jackson removed, limiting the war heroes in the hall to those who fought for America, not against it. Strangest fact: The hall was erected to block some other unsightly buildings. The Bronx Community College campus backs up onto the Harlem River, and the hillside buildings’ basement levels would have been exposed on the river-facing side. The college decided they would look “bare and unsightly,” so the architect suggested a terrace. 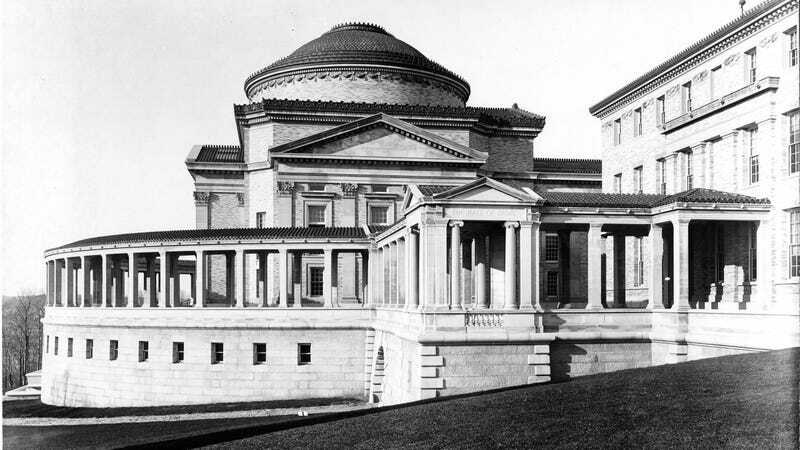 Fifty years earlier, Bavarian King Ludwig I had built two different German halls of fame, the Ruhmeshalle and the Walhalla, so NYU drew inspiration from those to build an American version. It opened in 1900 with 29 honorees. Thing we were happiest to learn: There’s a fun game to be played in trying to figure out who was and wasn’t inducted and why. Why do the authors in the group include the likes of James Russell Lowell and John Lothrop Motley, but not Herman Melville or Emily Dickinson? Why Daniel Boone but not Lewis and Clark? Why do the 12 presidents represented include Grover Cleveland, and why doesn’t he have two non-consecutive busts? Thing we were unhappiest to learn: The hall is barely more diverse today than its initial all-white-male class. Eight more busts were added in 1905, and three were women—Mount Holyoke founder Mary Lyon, astronomer Maria Mitchell, and women’s rights activist and educator Emma Willard. Only seven more women have joined them since. The hall wouldn’t get its first nonwhite member until Booker T. Washington’s induction in 1945; it added its second and last honoree of color, George Washington Carver, in 1973. The “black people without Washington in their name” count remains at zero, as does every other ethnicity. There’s an obvious (if still unsatisfying) explanation: No new members have been inducted since 1976, and inductees must be dead for 25 years, so the hall is really reflecting 1951’s cultural mores and has missed out on more than half a century of social progress. That being said, there was no reason in 1976, apart from the obvious, not to consider Frederick Douglass or Harriet Tubman prominent Americans. Also noteworthy: One reason for the lack of recent nominees is that the once-well-respected hall has largely been forgotten, and the private donations that were its lifeblood have dried up. Around the time the last class was inducted, New York State had to step in and spend $3.2 million to rebuild the foundation and restore the deteriorating busts. The hall spent 19 years raising money for a $25,000 bust of FDR, and ran out of money before it could sculpt Red Cross founder Clara Barton, Supreme Court justice Louis Brandeis, botanist Luther Burbank, and philanthropist Andrew Carnegie. Best link to elsewhere on Wikipedia: There’s a long list of people who were nominated to the hall but not accepted. Babe Ruth and Lou Gehrig, Amelia Earhart, Wyatt Earp, and a parade of mediocre presidents including Chester A. Arthur, James Garfield, notoriously corrupt Warren G. Harding, and William Henry “I Died 31 Days Into My Term!” Harrison. Perhaps the oddest nomination was Elena Petrovna Blavatsky, largely because she wasn’t American and therefore not eligible. Born in Yekaterinoslav, in what was then Russia and now Ukraine, Blavatsky was the leader of the occultist Theosophy movement, which attempted to revive a supposedly forgotten ancient religion from which every contemporary religion sprung. Further down the Wormhole: Only four visual artists made the hall—conservationist and bird painter John James Audubon; portraitist Gilbert Charles Stuart; Beaux-Arts sculptor Augustus Saint-Gaudens; and James McNeill Whistler, whose long career has been entirely overshadowed by Arrangement In Grey And Black No. 1, known to the public as Whistler’s Mother. Through some quirk of fate, that painting became one of the most instantly recognizable works of art to laymen, alongside Michelangelo’s David, and the Mona Lisa. What few casual art aficionados realize is that Leonardo da Vinci’s most famous work isn’t the Mona Lisa. It’s a Mona Lisa. We’ll look at the other one next week.